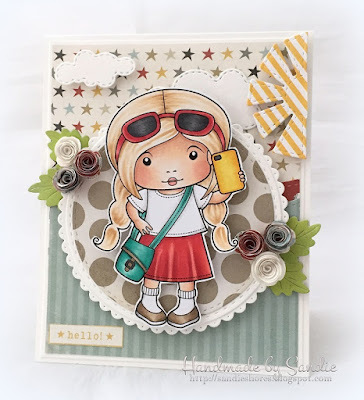 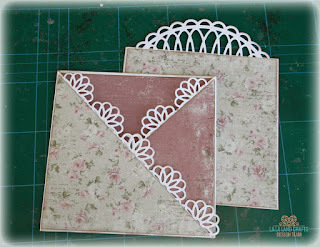 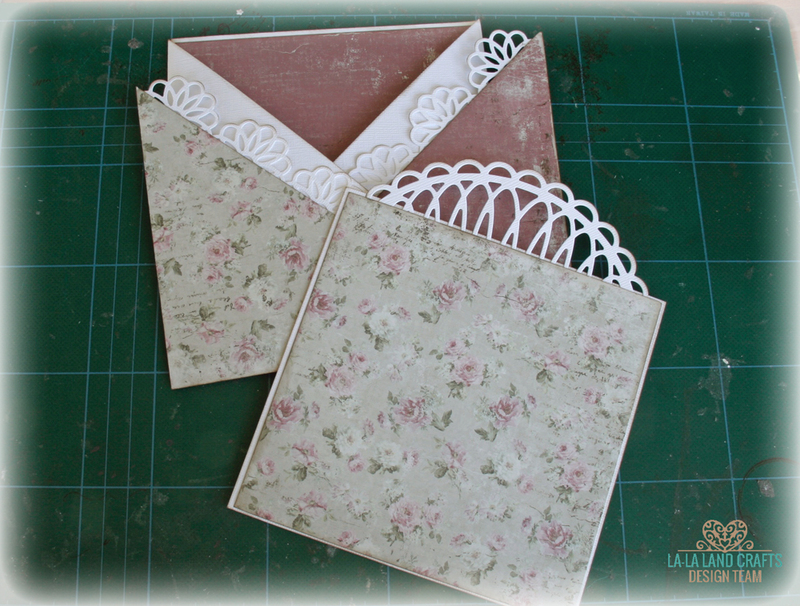 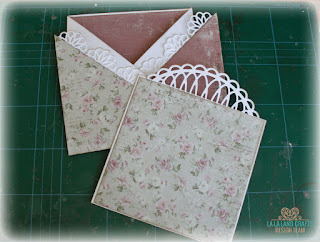 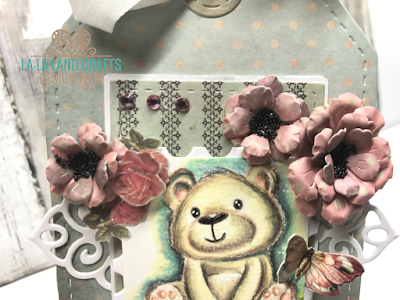 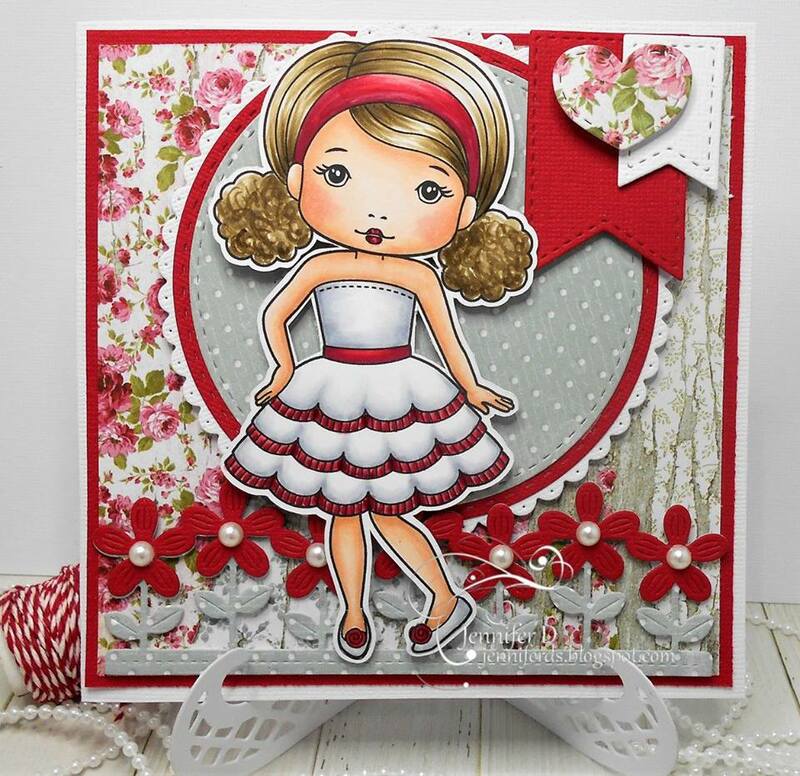 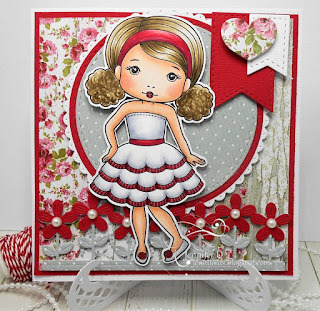 Hi, Elizabeth here for tutorial Thursday to show you how to create a Criss Cross card. 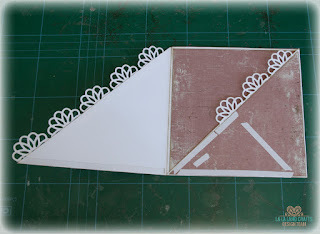 I also added a speed coloring video of how I made the folds on Marci's dress if you would like to see. It's a long post, so I hope you'll hang in there! For the card base I need two pieces of 6" x 12" cardstock. 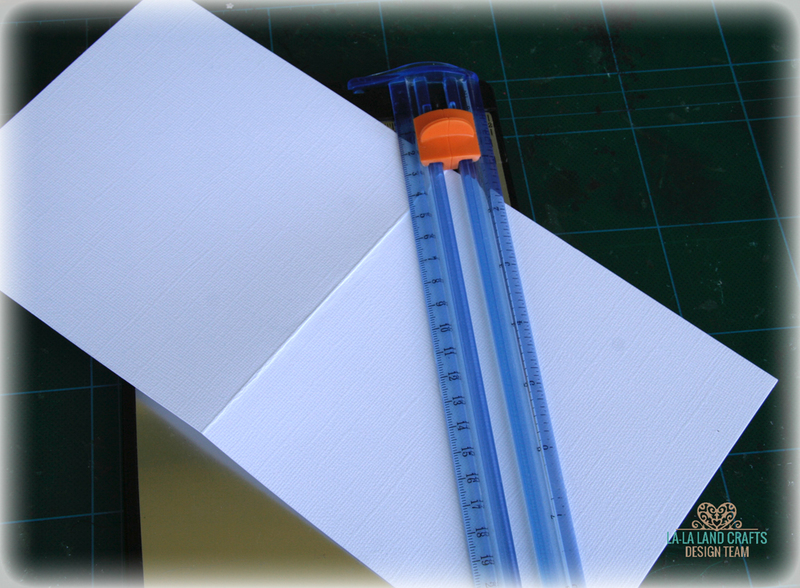 I score at 6" on both pieces to create the "pocket"card base. 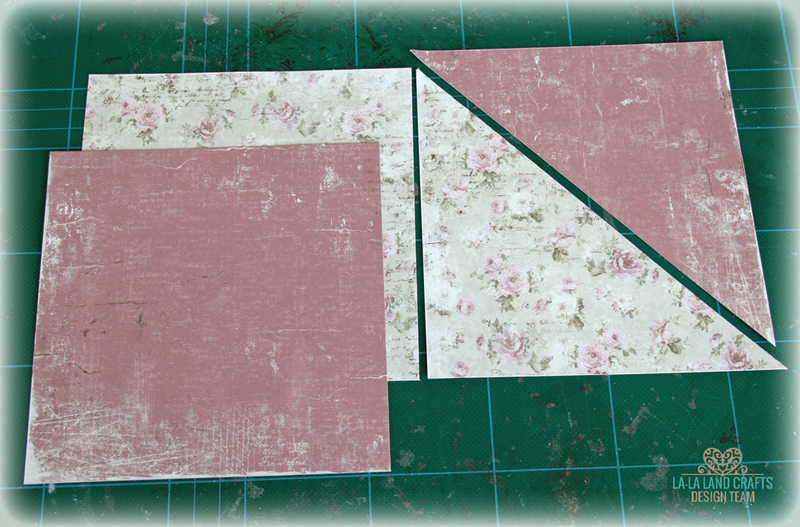 On both pieces I cut diagonally like the picture shows. 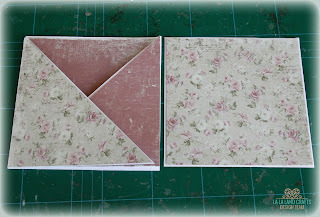 That leaves me with two pieces like these. I add adhesive to the back of one of the pieces and glue them together. Next I cut a piece of cardstock in 5 6/8" x 6" to create the card for the inside (on the left). 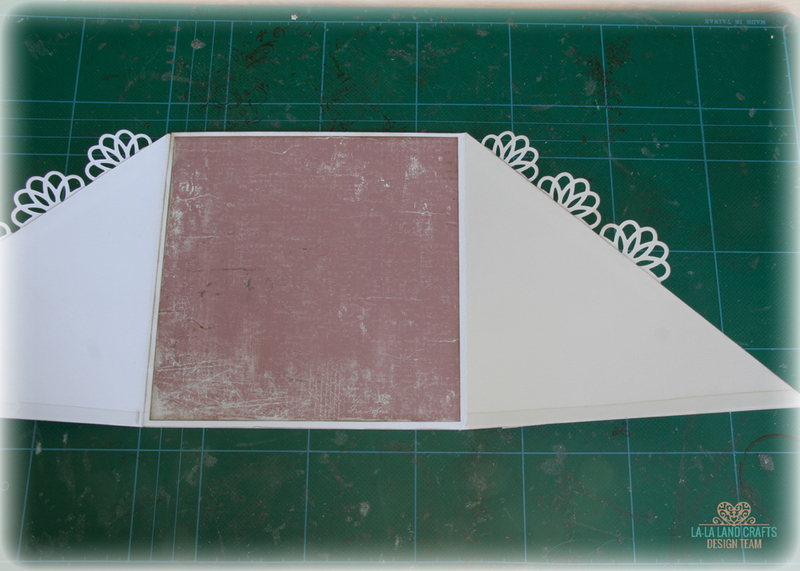 A second piece 5 6/8" x 5 6/8" which I cut I half diagonally and turn one of the pieces around. 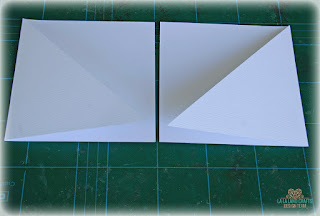 This works because the paper is double sided. If it is not, cut two triangles from the two papers you want to use. 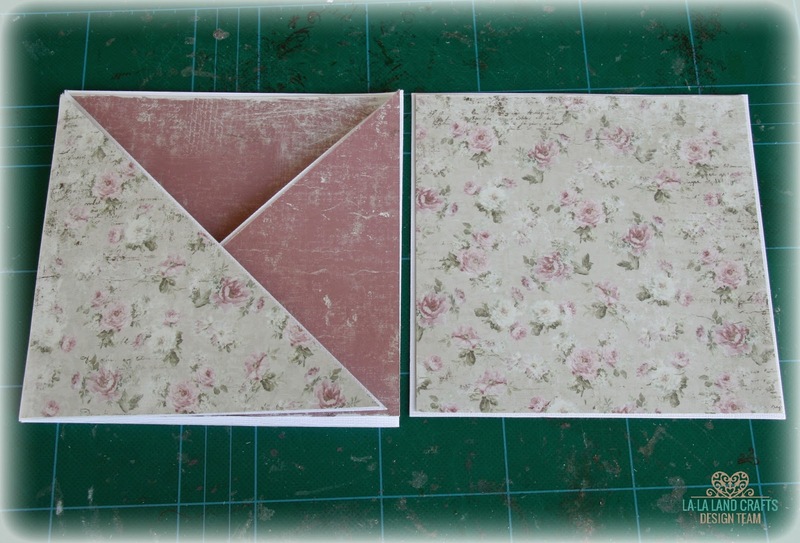 The third piece is for the card inside the pocket. Cut 5 4/8" x 5 6/8"
This is the way the design-paper goes- but do not glue it on yet! 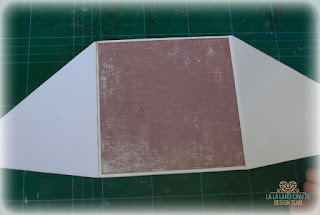 I like to distress the edges of the design-paper using distress ink, walnut stain. Next I cut all the gorgeous diecuts I want to use. 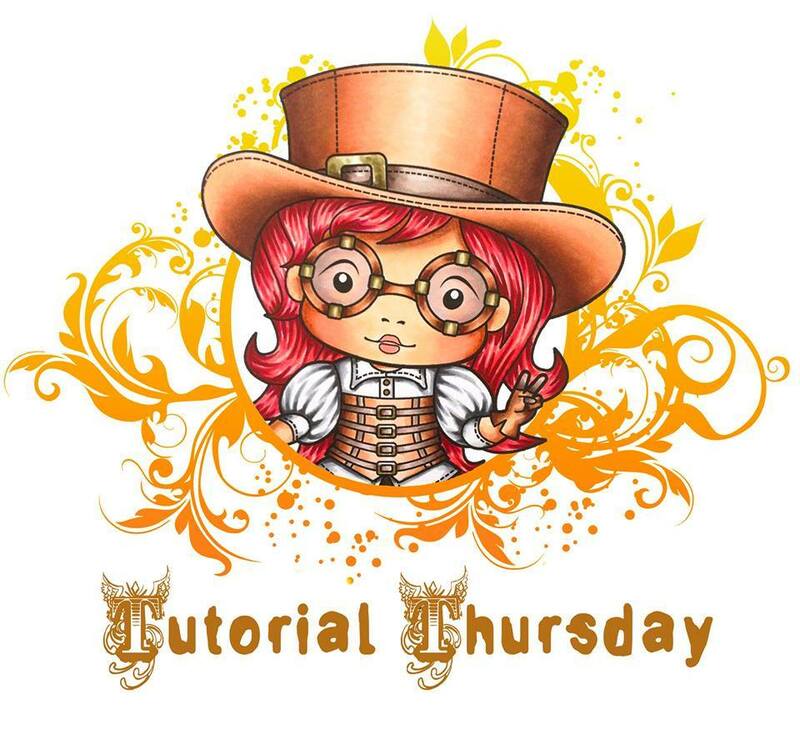 You can find a list at the end of the post. I glue the design-paper to the inside of the card. 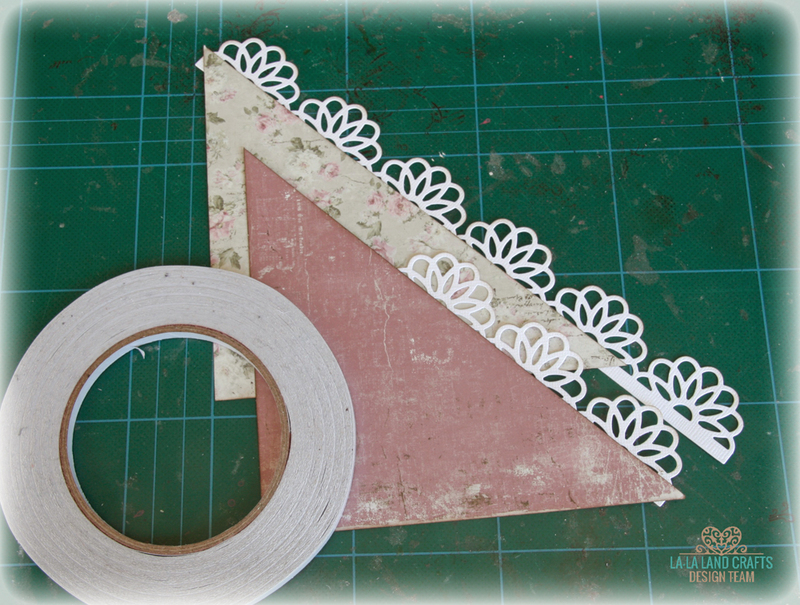 Next I glue the Loopy Border dies to the back of one side of the triangles, and cut the excess pieces. 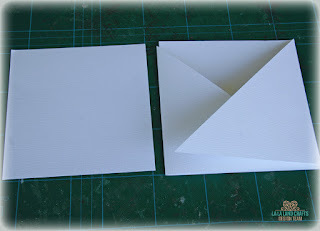 Glue the design paper pieces to the cardboard. Add tape to the bottom edge. 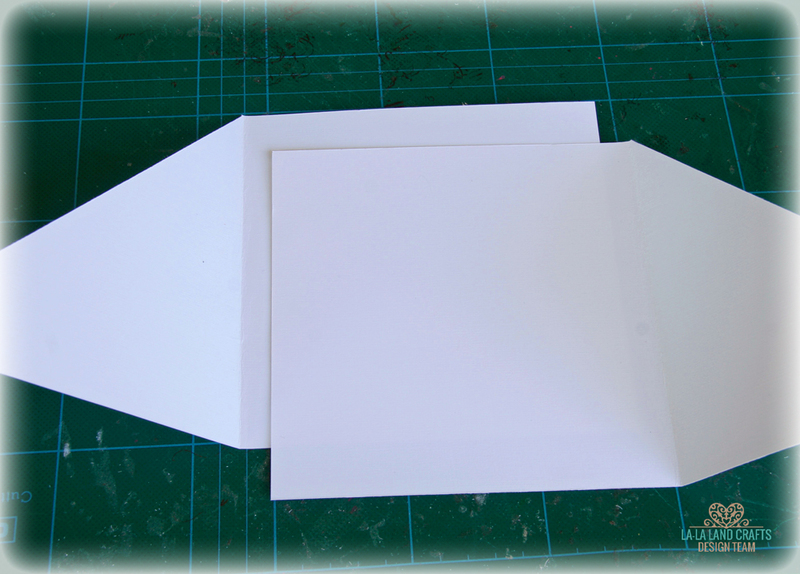 And tape in a small triangle to close the card. 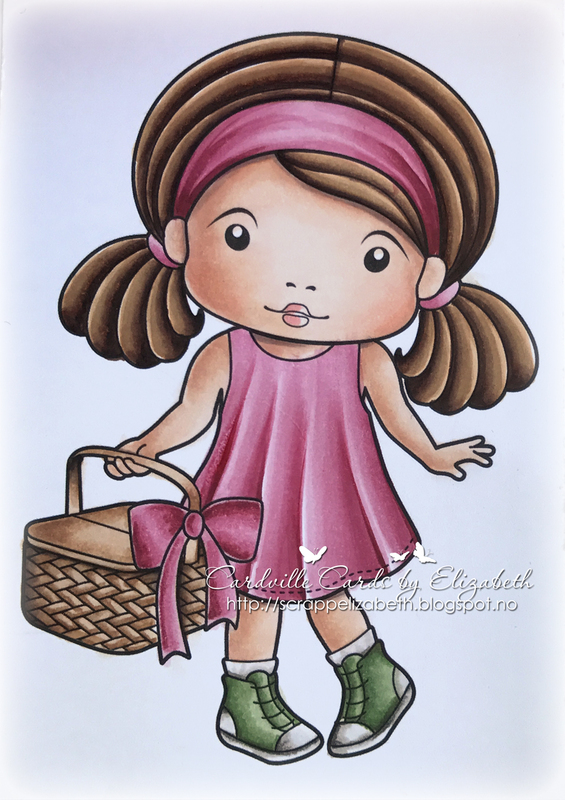 I stamped and colored Picnic Marci using my Copic Markers. I love to create folds and pleats, so i added some here. 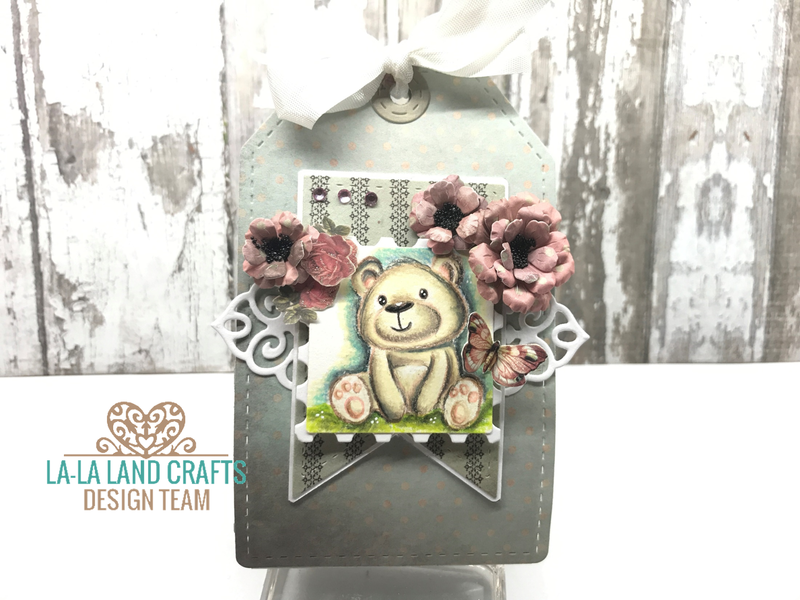 Here's my finished decorated card - both parts! 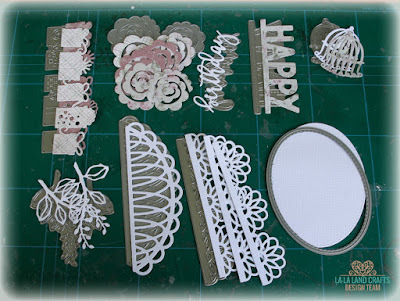 Picnic Marci, Loopy Border, Loopy Doily Border Die, Birdcage with Bird Die, Presents Border Die, Happy Stiched Die, Happy Birthday Die, Rolled Rose Small & Medium die, Shabby Flourishes Die (set of 2), Stitched Elements (set of 7). 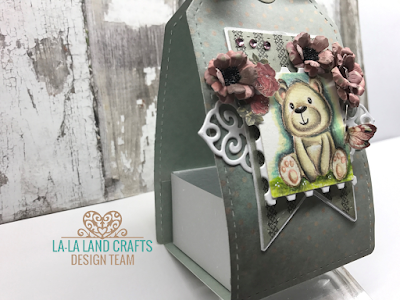 Hope you like my tutorial, I would love to see if you ever try it! 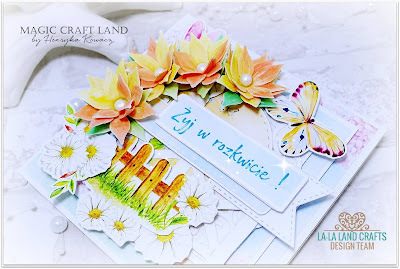 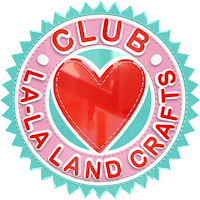 You can share your La- La Land Crafts creations with us in our Facebook group. 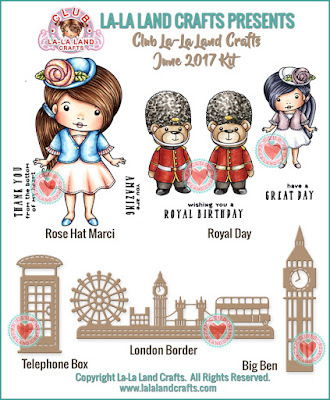 If you've missed a deadline for this month's Kit you can still sign up today to start your subscription with the July 2017 Kit! Sign up today to start your subscription with the July 2017 Kit! Irene here with you today! Today we all are making beautiful flowers using LLLC Dies.. Here is your inspiration from Team Monday! I hope you enjoyed and are Inspired!